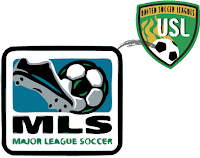 There's a large number of former MLS players who've eventually made their way to the United Soccer Leagues, the second division in the US and Canada. In fact, every team in USL-1 has at least one former MLS player, and many teams have quite a few more. This chart lists the current USL-1 players that have made 10 or more appearances in Major League Soccer. Real Salt Lake has more former players in USL-1 than any other MLS team. Former RSL players include: Chris Brown, Jack Stewart, Kevin Novak, Melvin Tarley, Luke Kreamalmeyer, Jay Nolly, Leighton O'Brien, Cameron Knowles, and Joey Worthen. There's also a large number of former MLS draft picks that never signed with the team that drafted them, instead ending up in USL-1. Matt Jordan has 119 MLS appearances. Thanks for the head up Daniel, not sure how I missed that one. I have Matt down for 117 appearances though, 114 for the Dallas Burn and 3 for the Columbus Crew. You have Chris Brown with 208 appearances, which apparently includes 197 in the regular season and 11 in the playoffs. But you have Jordan and Villegas with 117 and 109 appearances, and that's just the regular season totals. Also, the next guy is Armstrong, whose totals include his 6 playoff appearances. So you definitely need to make up your mind on which number to use. I definitely would not trust Wikipedia's numbers that much. Otherwise good job. Honestly, just compiling the players took me forever and I originally planned to go back and double check the crap wiki statistics, but obviously forgot about it. I've now changed it to show only regular season appearances, as listed at the all-time mls player register. Cool website, I had not noticed www.thebesteleven.com earlier in my searches!